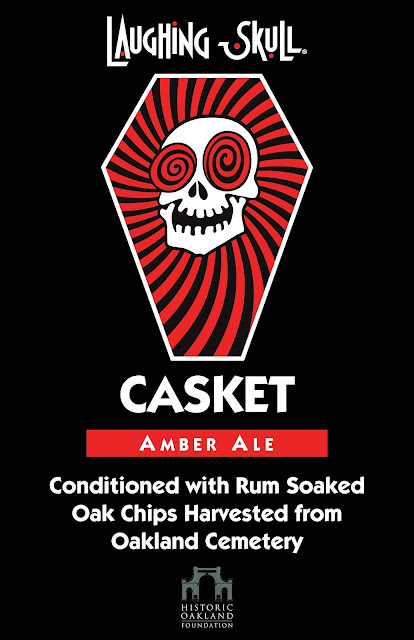 Earlier this month Oakland Cemetery created a signature beer with Red Brick for itsSunday in the Park fall festival. Rosemary’s Boneyard Brew, a blend of Red Brick Session IPA and rosemary harvested from Oakland’s gardens, was produced in limited casks that proved popular among the crowd. Held Oct. 23-25 and Oct. 29-31, Capturing the Spirit of Oakland’s nighttime tours feature costumed actors recreating the lives of over half a dozen Oakland Cemetery residents, as well as musical performances, a pop-up shop, and readings from a fortune teller. These tours sell out quickly every year, and tickets go on sale July 1 to Historic Oakland Foundation members, and to the general public on July 15. For more details on membership, please visit www.oaklandcemetery.com. Capturing the Spirit of Oakland is sponsored by Six Feet Under Pub & Fish House, Craft Creation & Design, Tin Lizzy’s Cantina, Paces Properties, Fulton Cotton Mill Lofts, H.M. Patterson & Son Spring Hill, Constellation Brands, Starr Hill Brewery, Doc Chey’s Noodle House, Republic Social House, and Mezcalitos Cocina & Tequila Bar. About Historic Oakland Foundation: Founded in 1850, Atlanta’s Oakland Cemetery spans 48 acres of gardens, wildlife and sculpture. Oakland is the final resting place for 70,000 people, including author Margaret Mitchell, 27 Atlanta mayors, six former governors, Civil War generals and soldiers, and thousands of unmarked graves. Oakland Cemetery offers critical green space for recreation and serves as a cultural resource for lifelong learners who come to study history, art, architecture, archaeology, horticulture, photography and more. Working in partnership with the City of Atlanta, Historic Oakland Foundation works to preserve, restore, enhance and share Oakland Cemetery. Visit www.oaklandcemetery.com for more details. About Red Brick Brewing: Founded in 1993, Red Brick began their brewing odyssey at a small building in downtown Atlanta. They have established a 20-year tradition of producing fresh, interesting, and delicious brews for your drinking pleasure. They pride themselves on crafting a variety of year round and seasonal offerings, including their exclusive Brick Mason series.